If you have green stains caused by low pH/acidic water, you need our Care Free pH Neutralizer. irritated. The first thing I asked him was "do you have copper plumbing?" and he said "yes, in fact, my pipes are getting pin-holes in them!" I told him to send us a sample so we could test his water at no charge, but that he probably had low pH which makes his water acidic and very corrosive. One typical sign of low pH in water is green staining as your copper pipes are literally being "eaten up" by your corrosive water. 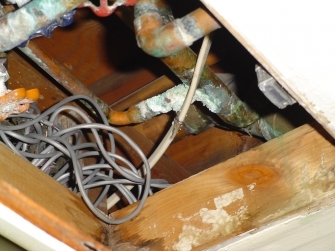 If not corrected, plumbing will become permanently damaged and destroyed, and will have to be completely replaced! Even plastic "pex-type" plumbing has brass fittings that can be damaged by low pH. I told him if you have green stains caused by low pH/acidic water, you need our Care Free pH Neutralizer to automatically raise the pH and eliminate its corrosive, damage-causing properties. pH is a measure of how acidic or alkaline your water is with 1.0 units being the most acidic, 10.0 units being the most alkaline, and 7.0 being perfectly neutral (neither acidic nor alkaline). The lower the pH, the more acidic the water is. Our single-tank in-line pH Neutralizer is guaranteed to automatically raise your pH back up to "Neutral" so it's no longer acidic, corrosive and causing damage to your plumbing.